28mm Victorian Warfare: "This R2 unit has a bad motivator!" I had hoped that I would take part in 'Forgotten Heroes' this month, but it would appear that my best laid plans have come a little unstuck at present. I had an idea ready to go and with the help of Jez, of 'Carrion Crow's Buffet', had even sourced a couple of likely miniatures ready for conversion. It may well be that I enter something before the end of the month, but just for the time being, I have a couple of other items that are demanding my attention. 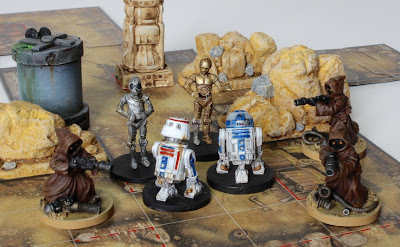 The first of those items are a couple of droids that formed part of a care package from the incredibly kind and generous Dave Stone; he of 'Wargames Terrain Workshop'. Now before I go any further, I need to stress that these miniatures are custom sculpts, produced for Dave's own personal amusement and are not commercially available due to licensing restrictions. Apparently during an email exchange, I sounded a little down and the next thing I knew an amazing assortment of Star Wars inspired miniatures had hit the doormat of Awdry Towers. I hope to show more of the denizens of Jabba's palace in a future post, but instantly fell upon the droids to paint first, seeing that they fitted into my current theme. 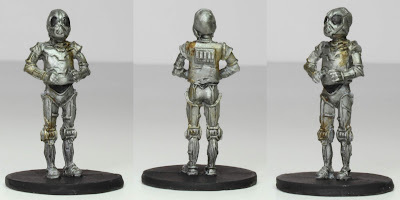 Sensing an easy win, painting wise, I decided to start with an RA-7 Protocol Droid; Action Figure aficionados might remember this one as the Death Star Droid. The body was duly given a silver base coat before washes were applied and the various details picked out in black. A RA-7 can be seen in the Jawas' Sandcrawler during Episode IV and so I decided to give mine some additional weathering and rust to match the hapless droid. If RA-7 was to be a quick win then R5-D4, the second of my droids, was to prove much more costly, time wise. As with my R2-D2 the miniature this droid has a lot of small detail and required a bit more concentration and research to finish. Certainly not blessed with a lot of screen time, R5-D4 was always a favourite of mine and so I couldn't be more thrilled to add him to the collection. 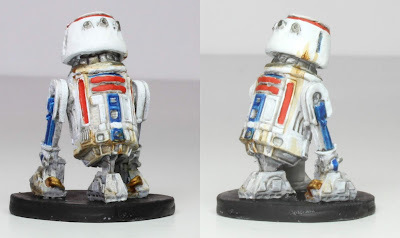 Similarly to RA-7, I wanted to give the droid a weathered feel and so more washes and rust effects were applied, although I stopped short of adding his shorted motivator unit. 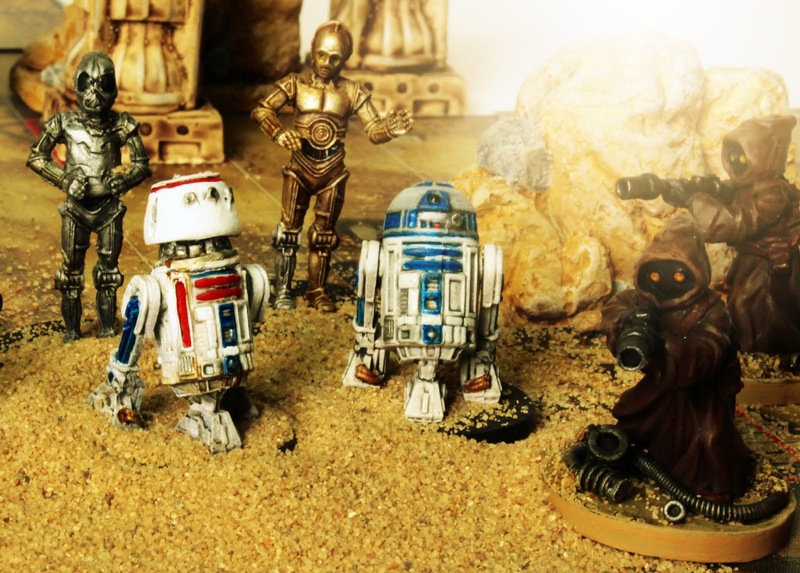 So with two more droids added to the collection, a droid hunt across the Tatooine sands is looking like a real possibility as a scenario. I just need to thank Dave again for his hugely generous gift and can confirm that it most definitely brought a smile to my face. Thank you, there is still a lot of month left so might get something done yet. nice one Dave for the generosity (very typical for Dave, he is a diamond). Brilliantly painted too. win-win! Thank you Andy and I couldn't agree more regards Mr. Stone. A droid hunt? That sounds a bit like an Easter Egg hunt, no? Such a lovely thing to say Dean, thank you. A bad Motivator? Sounds like he works for the same boss as I do. I never got the concept behind protocol droids. Are they supposed to tell one when to use the fish spoon, or how to do the wiener waltzer? I say chaps, These are not the droids one is looking for. Or do they diplomatically record all my..sorry, ones Transactions? 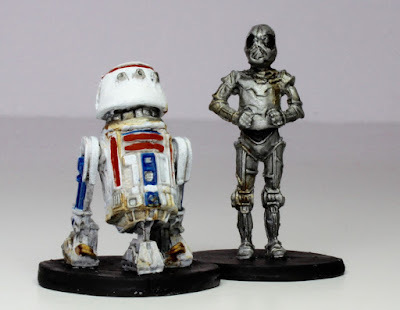 Nice one Dave and well painted Michael, a droid hunt sounds like a fun game. It was Clint's idea, Jawas trying to recapture troublesome droids as they wandered around the deserts of Tatooine. Superbly painted! Those are a couple forgotten (by most) droids. Very cool. Dave does some wonderful sculpts. Thank you LT, blown away by Dave's generosity. Wonderful additions to your collection Michael, seems the admiration of your followers has paid off! Thank you Terry, it was such a lovely gesture, I need to paint Jabba's band now - so excited. Nice one Dave! And very nicely executed Sir M! Thank you Ray, it was such a blast when they arrived in the post. Nice idea, putting them next to each other like that. They look a bit like the doublegangers of two more better known droids, could they be con artists? These look like top sculpts and you did them more than justice by painting them like you did. Thank you, they work really well with the other sculpts and so pleased to have them in the collection. oh, You're master Michael! Lovely work! That is far too kind. I won't lie, I am incredibly jealous of you. And the paintjobs are just gorgeous! Sorry about that Mike, but they were too nice to keep a secret. Nice work on two of the less popular droids...although I had both of the action figures for these, as my brother had R2 and 'goldenrod', so I wanted to be different. These are of course the droids we're all looking for! Great work Michael! Wondeful work on those droids! 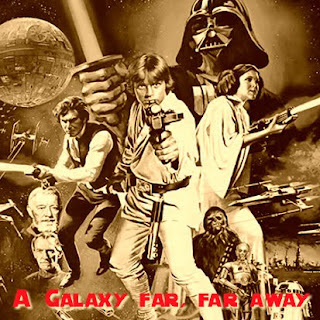 Great additions to your growing SW collection. Well done on both droids ... I'm liking the RA-7 Protocol Droid more for some reason. :) RA-7 was one of my favs. Lucky so-and-so. Both look perfect.